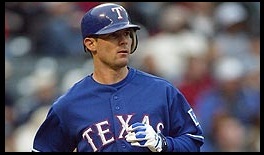 PBR - The Phillies have demonstrated an interest in Rangers' third baseman Michael Young, according to various sources. Young would be an upgrade at third base over Kevin Frandsen and Freddy Galvis, but the 36-year-old is owed $16 million in 2013 and his production is on the decline. After leading the American League in hits in 2011 his offensive numbers dropped significantly. He hit just .277 with eight homers, 67 RBIs last year, his lowest offensive output since 2002. Young has spent his entire career with the Rangers and has a full no-trade clause in his contract, so he has final say on a possible move to Philadelphia. It's likely the Rangers would pick up a chunk of Young's salary to make a move happen. The Phillies would probably will give up some pitching depth, but the players involved would depend on how much of Young's salary the Rangers cover. Reports surfaced this afternoon that the Rangers could cover as much as $10 of the $16 million he's owed. Young broke in as a middle infielder in 2001 and is a seven-time All Star. He's played 65 games at third base over the past two seasons and has a .956 fielding percentage.